The headline is a little misleading, since no-one here is telling America how to fix its voting system. But there are a few things about voting in Australia explained. 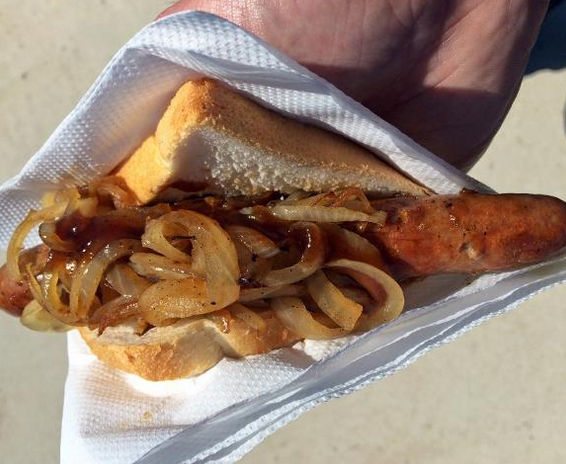 The dirty work of democracy is often compared to the making of sausages, but Australians almost take that maxim literally — turning Election Day into a countrywide barbecue, in which the grilling of hot dogs is optional but voting is compulsory. More than 96 percent of eligible Australians are enrolled to vote. Of those, more than 90 percent typically turn out to cast ballots for a federal election, far more than the 55 percent of eligible Americans who participated in the 2016 presidential election. As Americans prepare to vote in the midterm elections, we asked our readers in Australia to share their experiences and feelings about compulsory voting and explain the ins and outs of the process. Yeah, we forgive the NYT for that goof. They are, after all, writing for an American audience, and America doesn't have an equivalent to the classic Aussie sausage. So they substitute a term that is close enough to get the message across. What is this "Democracy Sausage" of which they speak? I have never heard this phrase used in 50 years of voting, Federal, State and local. I am certainly familiar with Sausage Sizzles, which are everywhere on a Saturday including outside supermarkets and shopping complexes, on beaches, in backyards (I was eating sausages in Bread over 60 years ago), and on election days as local community fundraisers. But Democracy Sausage? It was, is and always will be a Sausage Sizzle, and is not even close to defining snags eaten outside a Polling Booth on election days. Some people vote early, and don't have breakfast just thinking they will grab a sausage and a Coffee at the Community Hall/School, RSL etc. That is the tradition. Tell us about "Donkey Votes", and the importance of position on the ballot paper in a system of compulsory voting. Then tell us how an Aussie sausage isn't just an English sausage. The reality is that compulsory voting is a permanent fixture in Australia. We have compulsory taxation and compulsory compliance with the law. Some don’t vote, don’t pay taxes and break the law. They face the consequences, a very minor fine in the case of not voting. I’m not sure of the effect of donkey voting, but I’m pretty convinced it is minor. In almost every case one of the two major parties win in the lower house. If the practice of voting 1,2,3 etc down the ballot paper was prevalent I think you would see far more minor parties and independents get up (yes, I know it’s complicated by the preferential system). The point being that if someone doesn't want to vote but feels forced to by the fine, then the outcome is generally spoiled ballot papers or a donkey vote........in which case there is actually a negative in forcing those people to have voted in the first place. Oh my gawd, there is ketchup on those sausages. You people are animals. Do you have evidence for this? I doubt it is correct. In my experience reluctant voters grab the voting guide of their least despised party and follow that. ETA if a reluctant voter wanted simply to spoil their vote they would vote informal. After all, any blind, or donkey, vote would still elect a politician. Yet we know informal votes are very few. In the recent Wentworth by election, they were below 1%. No, I think when people are compelled to vote, they almost always take it seriously. Last edited by lionking; 31st October 2018 at 01:04 AM. In the case of a spoiled ballot, what's the actual negative impact? A spoiled paper gives a much clearer message than simply not turning up at the polling station. That’s true, but it happens so rarely it makes the news, like the voter in the Wentworth by election who crossed out all other candidates and put Turnbull’s name in. Took some effort. Okay, I did underestimate the total informal vote. Over the nation at the last election it was 5%. This, of course, includes simple mistakes, like someone who only puts in the first preference and not others, and people who put in A B C rather than 1 2 3. So bigger than I guesstimated, but still not a major issue in my view. In preference voting Donkey Votes can be dealt with by randomising the order of candidates on different papers. Agreed. Certainly in Ireland (which uses PR/STV) it's not an issue. IIRC the reason for the random allocation of ballots was precisely because of that. So we run with a preferential voting system that requires you to number each choice from one to however many candidates there are and your least prefered choice. A donkey vote is when you apathetically number down the page. A percentage of people will do that. When they are packed with crocodile or kangaroo. Last edited by Sideroxylon; 31st October 2018 at 05:35 AM. Given the position is randomised before printing it has little to no effect. And an Aussie sausage has more sawdust and less meat than an English one. While it is pretty clear that there is some serious work being done in some states to reduce voter participation, the culture of voter participation in the US is pretty weak. I live in Massachusetts, which makes it very easy and convenient to vote. You can vote by mail, you can vote early (polls open every day near me for two weeks prior to election), the poll itself is open more than 12 hours on election day, and it is within walking distance of my apartment. Even still, voter participation on presidential election cycles is about 75%, and only 50% on non-presidential elections. People just aren't motivated to vote, especially for the unsexy "off-year" elections. Last edited by SuburbanTurkey; 31st October 2018 at 05:19 AM. Preferential voting alone would be a massive game changer in the US. Compulsory voting I'm not so sure about. Last edited by Dabop; 31st October 2018 at 05:25 AM. Here in America the talking point of a 'silent majority,' the political equivalent of that one dofus in every online discussion who's main argument is "Well all the lurkers agree with me" is too common and well used of a talking point. It's a great way to claim a consensus or majority where none exist. Nobody can be sure what the majority of non-voting Americans really are going to vote on if we force them to the polls. We can make educated guesses based on demographics and polling and all that, but we can't be sure. I don't think anyone with skin the game really wants the risk of introducing a... what several tens of millions at the very least... players to the game under those circumstances. Tomato Sauce, while equally disgusting, is different from ketchup, it's much less sweet. Silent Majorities which are in actual fact a noisy minority exist everywhere in the world, that's not an American thing. Out the front of a Bunnings hardware store? In NZ as well. Generally using the lowest grade 'sausage' ever. Disgusting things, although I admit I've eaten my fair share. It's a rule. To go with the shonky 'sausage'. I don't think you get the inherent Cut-me-own-throat dibblerishness of this food. Sausage? Australian politics are weird. In the case of a spoiled ballot, what's the actual negative impact? Well, there's the loss of fuel and time that accompanies the empty ritual. There's the opportunity cost, generally, of performing an empty ritual when the same effect could be achieved by simply doing anything else with your day. A spoiled paper gives a much clearer message than simply not turning up at the polling station. This seems unnecessarily patronizing. You've decided for me what my non-vote is supposed to mean. You've decided for me what is the best way for me to achieve that meaning. And you've passed a law making it criminal for me not to do what you've decided is best for me. There's a lot of negative impact wrapped up in that attitude towards other people. Or you pay the fine and move on with life. We are overall less hung up on ideas of small government, interference in citizens’ lives, and tax obligations as long as there is the perception of a greater social good. At this point in time we accept obligatory voting as part of our social contract. Sounds very similar to the "Tailgate Parties" at US Football games. That is my problem with manadatory voting: if somebody is not interested in politics he will be casting a vote based on total ignorance or anger at being forced to vote, and either way it's probably better if he does not vote at all. I have never seen a convincing defense of manadatory voting,though some of the Aussies try. Nearest thing to that we have the US is the Chicago Style Hot Dog, which is a Hot DOg with a Garden of veggies on it.